So, rakeback is pretty awesome for SnG players. I think that a lot of 9-man and 6-man STT players are very aware of this fact, but a lot of HU SnG players are not. Obviously, the rake is about half as high at HU SnGs, so rakeback gives you about half the money, but it still adds up to a lot. If you don’t have rakeback (or the equivalent like a good VIP program or good bonuses), that might change your mind about playing. If you do, they’re a very reasonable option and probably the best choice for a lot of players. So say you’re grinding HU SnGs for a living, 4-tabling the $115s continuously (which is somewhere between really easy and really hard to do) with a 3% ROI and 33% rakeback . From the time that you finish one to the time that you finish its replacement takes about 12 mins (This might even be a high estimate), so you play 20 per hour. Playing a lazy average of 15 hours per week, you manage about 1,250 SnGs per month, which earns you a comfortable living of about $77k/year. Variance is fairly low, with a roughly 42% chance of no losing months in a year and about a 20% chance of having more than one losing month in a year. Of course, double the stakes, and suddenly you’re making a very substantial living. Double the time commitment (You’ll still be making money playing a card game less than the average working man slaves away at his job), and suddenly you’re making a very substantial living with very low variance. But, if you’ve read my other posts on this subject, you know that this is when I start depressing you by pointing out that you can never really estimate your winrate. The same is certainly true of HU SnGs. Indeed, the 95% confidence interval for someone with a 3% ROI (before rakeback) goes from -3% to 9%. So, you might be a losing player even after rakeback, or you might be one of the best HU SnG players in the world. 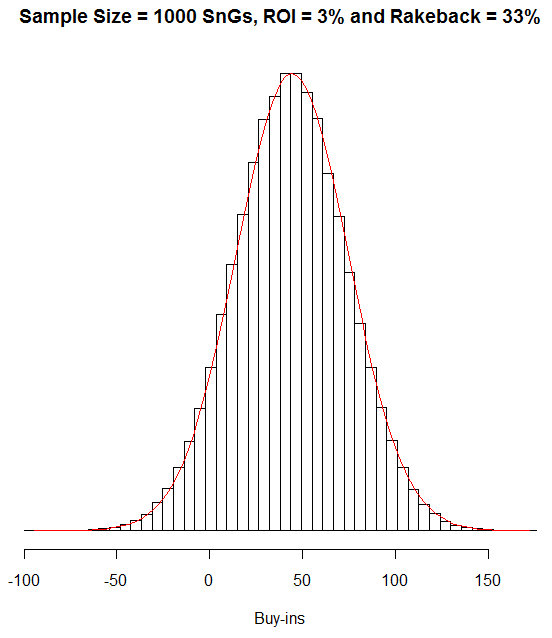 The 75% confidence interval is runs from about -0.5% to 6.5%. Still pretty gross, huh? Can a larger sample help? Well… No. If you want to know your winrate within 1% (e.g. 3% +/- 1% or 2% to 4%) at 95% confidence, you need to play about 34,500 SnGs. To know your ROI within 1% with 75% confidence, you need to play just under 12k SnGs. 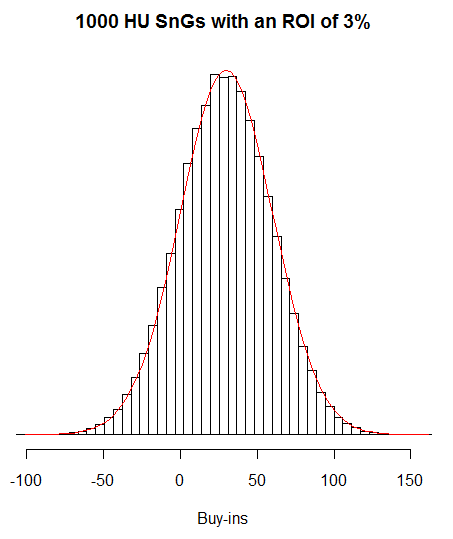 You can get a 75% confidence interval of +/- 2% (e.g. 3% +/- 2% or 1% to 5%) over 3k SnGs, so that’s sort of some silver lining, but 75% confidence ain’t great and +/- 2% really ain’t great either. Plus, HU SnGs are constantly in flux. The games can change dramatically depending on who’s playing in any given week. So, extrapolating your winrate from the past to the future in these games is even more risky than in other games. And, HU SnGs are sufficiently complicated that you have basically no chance of estimating your own winrate by comparing yourself to other players (like I suggested in STTs). And, of course, you will be incredibly biased when you estimate your own winrate in general. So, use of these types of statistics is risky because for many reasons, you might not know what your future winrate will be. The way to combat all of this is to be conservative with your estimates. If your ROI over your last 3k HU SnGs is 4%, then prepare for the possibility that your expected winrate over the next 3k HU SnGs will be, say, 1.5%. One more caveat, and then the data dump. I’m going to list a few absurdly high ROIs as well because, well, some people table select heavily and some people specialize in goofy games like NL O8 or whatever. The highest I’ve seen over a decent sample at NLHE over the last year that wasn’t heavily table selected was about 6%. So, once again, your ROI and rakeback (or just your ROI after accounting for rakeback) have a huge effect on how much variance can hurt you. If you have a 2% ROI without rakeback (or equivalently, a 2% effective ROI after rakeback/bonuses/VIP rewards), you’ll lose 25% of the time over 1k tournaments and still 7% of the time over 5k SnGs. That’s obviously pretty gross. Compare that to someone with a 4% ROI and a decent rakeback (or equivalent) deal, who loses only 4% of the time over 1k tournaments and basically never over 5k. In fact, if you’re really good (i.e. 6%+ ROI) and have decent rakeback, you can make 6 figures a year at these things lazily, at low stakes, and with a pretty negligible bankroll, and extremely low variance. In 92% of years, you won’t experience a losing month if you play at least 1k SnGs per month.. If you’re not very good and don’t have rakeback, these won’t be so fun, and even over very large samples, you’ll be a slave to variance. If you play HU SnGs for a living or are considering doing that, take a careful look at this table. There’s a lot of information there, and a lot of it will probably be quite surprising. One teaser of a closing note: HU SnGs are actually remarkably easy to compare to other forms of STTs. In spite of the completely different format, you can play about as many 9-man STTs in an hour as HU SnGs, and ROIs are roughly comparable. Obviously these comparisons aren’t perfect, but this happy coincidence makes this comparison a good rough example to illustrate where I’m going with this: Say you’re choosing between playing 1k 9-mans with a 6% effective ROI and 1k HU matches with the same effective ROI. Which would you rather do? Well, look at the tables: The 9-man option will lead to a 10% chance of loss, whereas the HU options will lead to only a 2% chance of loss. I haven’t crunched the numbers yet to do a thorough study comparing the different games. But, that’s where I’m going. Stay tuned. for next post FR TAG with 3BB/100 winrate stats would be awesome. thanks for ur work ! can u make a statistic test about “Life as a NLHE 9” ?